Episode 27: "The Airport Murder Case"
Joan March arrives from Paris at the train station in Rome. Upon exiting the crowded station she is gunned down by someone in a passing vehicle. 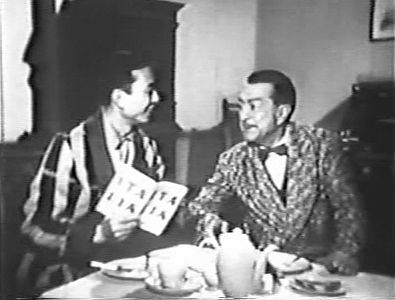 In their room at the Bernini Hotel in Rome, vacationing Charlie Chan and Number One Son, Barry plan their visits to the historical sights of the Eternal City. A knock at their door proves to be Dino Rienzi who, hearing that Chan was in Rome, has come to ask the detective’s assistance in solving the murder of his friend, Miss March. Rienzi's desire is that Chan can work on the case without innocent people, including himself, will not be needlessly hurt through unpleasant publicity as a result of an investigation. When asked where he was at the time of the murder, Rienzi notes that he was at his villa in Ostia, alone. After Rienzi leaves, Chan calls his old friend, Inspector Galvani of the Rome police. Galvani is very happy to hear from Chan and asks his assistance in a perplexing case of espionage involving the leaking of information about the construction of a secret reactor plant. Chan apologizes and explains that it will Barry who will be paying him a visit due to his insistence on taking up the murder case himself - along with his father's assistance. Chan agrees that he will help his old friend out at the conclusion of the murder case. While goes off to see the Inspector, Chan pays a visit to the Acadian Club where Joan March was a singer billed as "La Bella Americana." Before entering the club, the detective notes the hurried arrival of a vehicle which enters a garage behind the club. Inside, the detective meets Marta Ricci, the owner of the Acadia Club. Marta notes that at one time Joan and Dino Ricci had been in love but in recent weeks Dino had stopped coming by the club. Chan and Marta are interrupted by Alfredo who informs the club owner that he has brought her special order of lobsters. After Alfredo leaves, Marta explains that there was gossip about Rienzi's desire to marry a rich and beautiful American widow named Carol Vane. Marta tells Chan that Joan had gone on a short trip to Paris to purchase clothes. Chan, noting the expensive nature of clothing bought in Paris, asks if Joan was paid very well for her singing performances, to which Marta notes she was not paid beyond what other such singers are paid. When asked of her whereabouts at the time of the murder, Marta states that she was involved with bookwork at the club. Chan next visits Carol Vane at her apartment. She confirms that she and Dino are in love and have plans to marry in the future. She also states that, even though she had never met Joan March, she was well aware of Dino's past relationship with Joan, adding that he had not seen her since Dino and she had met weeks ago. Upon further questioning, Mrs. Vane informs Chan that if Dino had ever seen Joan again she would had dropped him immediately. As to where she was at the time of the murder, she tells Chan that she was out walking her dog, admitting that her walk took her near to the train station. At Dino's apartment, Rienzi admits that in spite of his relationship with Carol Vane he was still seeing Joan March. He tells the detective that Joan didn’t want to lose him and that she had threatened to reveal to Carol his desperate financial situation unless he agreed to remain with her. Although he had no longer seen her at the Acadia Club, he had given Joan a key to his residence. Even though Dino retains his villa and has excellent credit, in order to maintain his lifestyle, he admits to Chan, he must marry money. Suddenly, Barry and Inspector Galvani arrive at Dino’s apartment. Asked by the Inspector if he owns a .38 caliber automatic pistol, Dino readily admits he does and that it should be in his desk. Finding the gun, the Inspector notes that it had been recently fired and that it was a gun of this type that was used to kill Joan March. Pending a ballistics test, Dino is taken into police custody. The next day at the police station, Inspector Galvani informs Chan that tests have verified that the gun found at Dino's home is, indeed, the murder weapon. Informed that no fingerprints were found on the gun, Chan suggests that it may have been possible for someone else to enter Dino's residence to take the gun, use it to kill Joan March, and then, return it to the desk later. An inspection of the victim's purse reveals no key to Dino’s apartment. Chan suggests that this casts great doubt on Dino’s possible guilt, and Inspector Galvani agrees to release Rienzi for the time being. With Charlie Chan and Barry, Dino is happily reunited with Carol. However, Chan reminds everyone that Dino remains the number one suspect even though he will seek the true identity of the killer. Also, Carol lets Dino know that Joan had told her of his financial situation, adding that, although Joan had hope the information would cause her to leave Rienzi, she had no thought of doing so. To this, Chan brings up the discrepancy of Carol's earlier statement to him about never having met Miss March. She admits to her lie, adding that she had not wanted to become mixed up in the whole affair and that Joan's sole visit, on the eve of Joan's trip to Paris, was to inform her of Dino's situation. Chan then asks if Joan had asked for any money. Carol informs the detective that she had seen a wad of money in Joan's purse. Dino adds that Joan had, of late, had money to spare, even attempting to loan some to him. Dino then recalls something very odd that Joan had told him about how some people find a fortune in an oyster, but she had found one in a lobster. Back at police headquarters, Inspector Galvani provides information about how Alfredo Savati picks up fresh lobsters each Thursday from an old fisherman named Tocelli who has a small boat for coastal fishing. Galvani adds that the coastline where Tocelli fishes is heavily fortified and a reactor station is secretly being built in that location. Chan suggests a meeting at the Acadia Club that night after the club closes. Under the cover of darkness, Chan, accompanied by Barry who notes the absence of the Inspector, slips into the vehicle parked in the garage behind the Acadia Club and searches it, finding a spent .38 caliber cartridge shell. Nearly seen by Alfredo, who had come out to retrieve a communication device from the vehicle, Chan continues his search. Inside the club's office, Alfredo and Marta Ricci are busy searching for information about the secret reactor station that has been hidden there by Tocelli. Chan, who has slipped unseen into the office, witnesses this scene. Announcing his presence, Chan reveals his knowledge of how Joan March, having discovered their covert work, had blackmailed Alfredo and Marta who then killed Joan on her return from Paris, using Rienzi’s gun which they had taken from Rienzi's apartment. At this, Alfredo pulls out a knife and attacks Chan. A struggle ensues with Chan finally disarming and subduing Alfredo as Barry and Inspector Galvani arrive. "Well, Inspector, little bit late, but most glad to see you," states the victorious Chan, who informs Galvani of the traitorous spy work of Alfredo and Marta as well as the fact that it was they who had murdered Miss March. "After all, seems we had two cases in one, Inspector," Chan adds. In The Airport Murder Case the killing of Joan March takes place in the Rome train station. No airport appears or is mentioned in the plot. Dino Rienzi (to Charlie Chan): "When I heard you were in Rome I came straight to you." Inspector Galvani (to Charlie Chan): "Charlie Chan! But here, in Rome, is not possible!" Charlie Chan (to Inspector Galvani): "Yes, in Rome. Am so happy to talk to old friend." 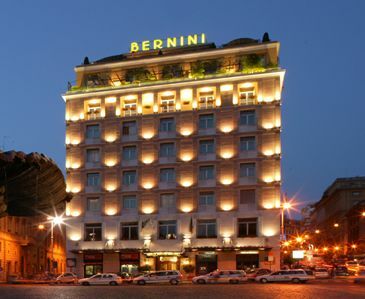 Hotel Bernini - The Hotel Bernini (today, Hotel Bernini Bristol) was built in the early 1800s. It faces the Piazza Barbarini and is located near the famous Trevi Fountain. The time of the murder of Joan March according to Charlie Chan: "4:32, yesterday afternoon." As Mr. Barnum once said, "When buying care for sideshow, two heads better than one." I must confide old detective saying: "When client wants trap set for another, sometimes gets caught by same himself." Very sedate – like nuclear explosion. In murder investigation, everything is grist to detective's mill. I understand many marriages are not necessarily made in Heaven. Visit to police station cannot prove guilt if innocent. Can say with confidence, obvious answer is not always solution to crime.